Thyme for Cooking's Main Courses: Braised Veal, Split Pea Soup. Cook pasta according to package directions. When done, drain. Roughly chop the pepper and onion. Roughly chop tomatoes, reserving all juices. Heat 1 tbs oil in nonstick skillet. Add the paprika, onion, pepper, garlic, and sauté over medium heat for 5 minutes. Add the beef and sauté, breaking it up as it browns. Add the tomatoes, juices, sherry, stock and herbs. Bring to a boil, reduce heat and simmer, uncovered until the sauce reduces and thickens, about 20 minutes. Pit and roughly chop the olives. 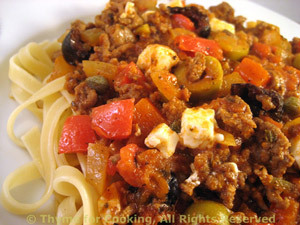 Stir the olives and capers into the sauce and simmer another minute. Remove sauce from heat and gently stir in feta. Spoon over pasta and serve. 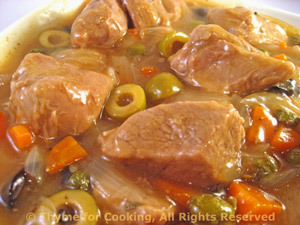 Large pieces of tender veal, braised with 2 kinds of olives and finished with capers; all in a simple white wine sauce. Cut veal into large chunks if needed. Heat olive oil in medium Dutch oven or other pot with tight-fitting lid. Add veal and brown on all side. Add white wine and stir up any brown bits on the bottom. Add carrots, onion, green olives and bay leaves. Bring to a boil, reduce heat, cover and simmer for 60 minutes. Turn the heat up under the pot and uncover. Add capers and black olives; remove bay leaves. Give the cornstarch mixture a stir and add to the pan a little at a time, stirring, until thickened to your liking. Gnocchi: Cook according to package directions. To serve: Put the gnocchi onto a platter. Spoon veal on top and serve. 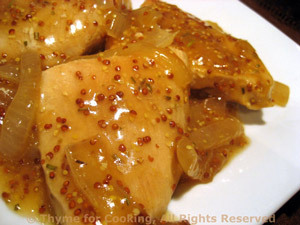 Turkey Cutlets with whole grain mustard and onions - simple, but full of flavor. Cut turkey into manageable pieces if needed. Sauté onion in oil in nonstick skillet over medium-high heat. When onion starts to brown, move it to the sides of the pan and sauté turkey cutlets until lightly browned. Add garlic and sauté briefly. Add mustard, chicken stock and wine. Stir to combine. Cover, reduce heat and simmer until done, about 10 minutes. Uncover, stir in vinegar, and let cook uncovered until sauce is thick. Serve. Chicken breasts, sautéed with shallots and mushrooms, finished with a luscious Tarragon Cream and served over pasta, simple mid-week meal worthy of your best china! Clean and thickly slice the mushrooms. Heat oil in medium nonstick skillet. Add chicken breasts and sauté about 7 minutes per side. Remove and set aside. Add shallots and mushrooms to pan and sauté until shallots are tender and both are starting to brown. Add tarragon and 1/4 cup of the chicken stock, stir to get all the browned bits off the bottom of the pan. Return the chicken to the pan and add remaining stock. Cover and simmer over low heat until pasta is ready. Wash spinach if needed and drain well. Very roughly chop or slice, just to get big leaves into 2 or 3 pieces. When pasta is done, drain and put into a bowl. Add spinach to pasta and toss to combine. Dissolve cornstarch in water and add to skillet, stirring until thickened. Remove from heat and stir in yogurt. Pour sauce over pasta, toss to coat. 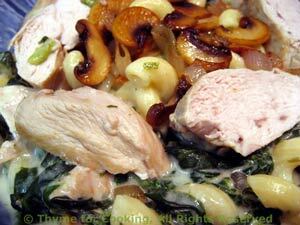 Thickly slice chicken breasts, arrange on top of the pasta and serve. If you are getting scallops in their shells, the shells make a lovely presentation. I love scallops but do not like the coral. Remove it or not as suits you. Be careful not to overcook the scallops. This used to be very decadent ... I made it recently and trimmed back the fat a bit. Still... I only do it once a year. Bring white wine, chicken stock and bay leaf to boil in large skillet. Add scallops and cook until just opaque, about 5 minutes. Remove and put into two individual baking dishes (scallop shells?) or 1 larger baking dish. Boil cooking liquid until reduced by half. Remove bay leaf. Mince shallot and slice mushrooms. Melt 1 tbs butter in medium skillet over medium heat. Add shallots and sauté 5 minutes. Add mushrooms and sauté until golden, about 8 minutes more. Add shallots and mushrooms to scallops, dividing evenly. Melt remaining 1 tbs butter in saucepan. When hot add flour and cook, stirring, for 1 minute. Reduce heat to low and slowly add in reduced cooking liquid, stirring constantly until thickened. Add crème fraiche and heat through. Pour sauce over scallop/mushrooms in baking dish(es). Sprinkle with bread crumbs and cheese. Bake in 375F (190C) oven for 15 minutes, until hot and bubbly. Serve. 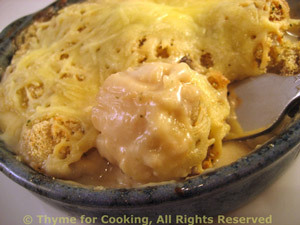 Traditionally made with a ham bone or ham hock, I made this with a slab of local, dry-cured ham. Regular baked ham would work as well. This will make 4 servings. If using a ham bone, put in water with split peas. If using Prosciutto or other ham, cut into bite-size chunks before adding. Roughly chop onion and add to pot. Peel carrots. Slice by cutting in half the long way (in 2 or mores sections) then into half circles. Add to pot. Peel and slice potatoes to a similar size; add to pot. Slice celery, cutting the wide end in half lengthwise and add to pot. Cover and simmer until all vegetables are done, 30 - 45 minutes longer. Remove ham bone, if using, and cut ham. 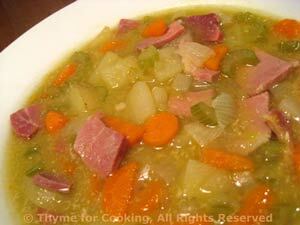 Add ham back to soup.